The days have quickly stretched from four hours of weak sun to a full twelve hours by the middle of this month, and while the sun never rises higher than halfway up the sky, its light is blinding as it reflects off the snowy landscape. It�s been an exciting month since our last newsletter. We�re at 25,000 Watts, and the KNOM signal has been chock full of interesting and thoughtful programming for our remote village audience. We thank you for your faithful support and for your prayers, both of which keep our mission alive and strong. God bless you for your help! (left) A local Nome dogteam winds through scrub arctic willows north of town. 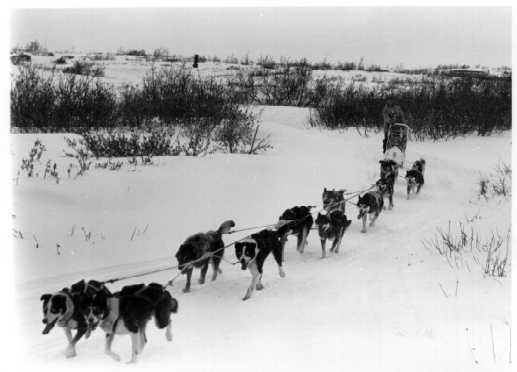 March is dogsled month throughout Alaska. KNOM�s Paul Korchin is on the Iditarod trail, following the great race via small plane, keeping KNOM listeners in touch with all the action. of news, inspirational and educational spots, public affairs programs, music and companionship. It�s a time of year that used to harken suicide and depression, but is now filled with excitement, as people keep a close ear to the radio to learn news of their favorite musher. INSPIRATIONAL SPOT: The Iditarod Trail is marked by sturdy tripods. A single post will not hold up to an Alaskan winter. Each post must be the same length or the tripod will topple in the wind. Three equal posts fastened together form one tripod. So it is with the Blessed Trinity, three Persons in one God. As you�ll see inside, a brief period of +30° weather in early February allowed contractor Randy Pomeranz to build our emergency generator shed. Another spate of cold weather and drifting slowed things down, after the building was closed in. See the photos below! Russian Orthodox priest Fr. Michael Oleksa visited Nome in February to conduct two days of workshops. Father Oleksa is a renowned expert in cross-cultural communications, and taught health workers and school teachers the differences in perceptions and behaviors between Alaska Natives and western European/Americans. Thousands of people unable to travel to Nome were able to hear his fascinating lectures in a special week-long series of 90-minute programs over KNOM. Thanks to five rare +30° days, contractor Randy Pomeranz plowed the usually-drifted KNOM road and built our emergency generator building by forklift. In this photo, you see the new shed in relation to the new KNOM transmitter building at left. Workers set up three of the pre-fabricated walls, preparing to hoist the generator inside. 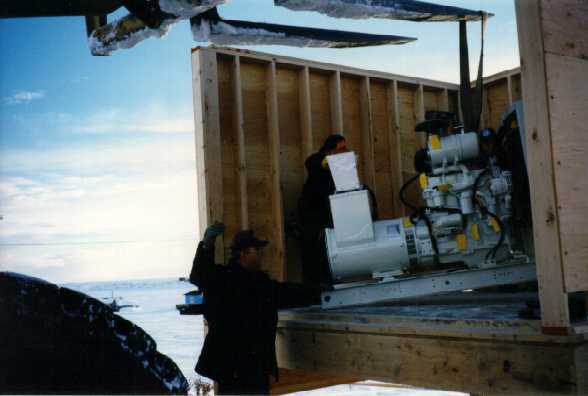 A few minutes later, Doug Doyle of Nome Machine Works signals the forklift operator as the 66,000 Watt emergency generator is delicately lowered into the three-walled building. Workers inside then scooted the 1,900-pound generator into place. 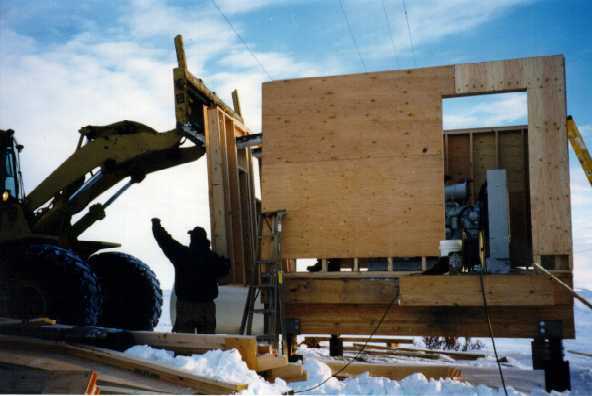 Although the doorway is wide enough to accommodate the generator, you can see that with the building brand new, how much easier it was to simply load the generator through the not-yet-built fourth wall. 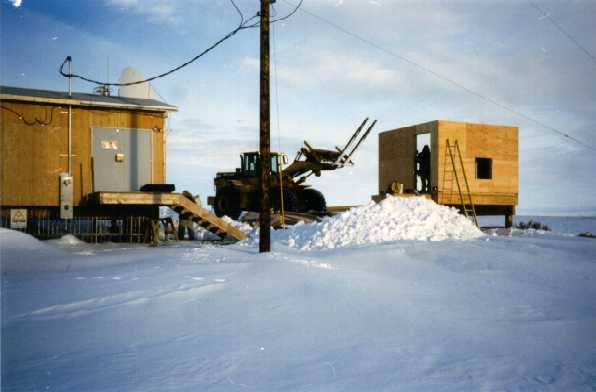 Within a day, the building was sheathed and roofed, although another batch of bitter weather slowed progress in mid-February with bone-chilling wind chills and high drifts across the road. One is often carried away over the sins and shortcomings of others. It would be far better for one to talk less about them and to pray to God more. (Left) A worker guides the forklift operator, gently raising the fourth and final wall of the generator building in place. The new generator will be capable of powering KNOM at 25,000 Watts during routine power outages and weather emergencies. 25 YEARS AGO: In March 1973, the Associated Press shipped up a tape-punching transmitter, outfitting the KNOM newsroom as an AP bureau. Volunteers Les Brown, Tom Busch and Scott Diseth kept the AP teletype clicking, feeding the world news of the first Iditarod Trail race. KNOM�s live coverage of the finish was rebroadcast in Anchorage, and starting a long tradition, the station met every musher at the finish line for a live interview. The KNOM gang kept listeners informed by foot, car, snowmobile and airplane. Setting another precedent, the race left the hardworking KNOM crew exhausted! INSPIRATIONAL SPOT: Scatter love as you scatter seeds. Your store stays undiminished, for love makes more love, as seeds make more seeds. ....75 miles northwest of Nome, the isolated village of Brevig Mission made the news last month, when exhumed tissue samples, frozen in the ground for 70 years, revealed protein from the influenza virus that swept across the world in 1918. That year, 85% of the village died within a single week. According to an old Hudson�s Bay Company document, the word comes from the Chinook Indian language, and was used by sourdoughs to describe newcomers to the north. We�re happy to announce that KNOM has accepted two "cheechako" volunteers, to begin work at the mission next summer. If you know of a young person, preferably just graduating from college, whom you think might make an excellent KNOM volunteer, please have them contact us immediately. We�re still hiring. Several of our benefactors now check into the "Nome Static" via the World Wide Web. The electronic version of our newsletter includes most of our photos in full color. You�ll find over a hundred other pictures and lots of other information at: www.knom.org. In January, a pump failed at the 40-year-old school in the village of Pilot Station, in the heart of KNOM listenening country, about 180 miles south of Nome. As a result, the elementary school�s sewage system quit and the school found itself forced to abandon its toilets in favor of honeybuckets. To cut down the risk of transmitted diseases like cholera and hepatitis, officials shortened the school day, and some parents have temporarily withdrawn their kids from school. INSPIRATIONAL SPOT: Cruel things do not reveal a cruel God; they hide from us the God of love. In late February, a hundred village elders from throughout the region gathered to discuss a host of serious issues. How can we preserve traditional language and culture? How do we address the many problems Native Alaskans suffer, such as alcoholism, depression and poverty? As you can imagine, thousands of others cannot afford the air fare to Nome to take part in vital get-togethers like this. However, thanks to you, KNOM was able to give everyone a front-row seat as we broadcast all three days of meetings, live. As you may know, fishing in this area collapsed last summer. With so many families who depend upon the seasonal salmon harvest to feed their families, the lack of fish was a full-blown disaster. The week after the elders� conference, the Alaska Board of Fisheries held a rare and historic meeting in Nome, asking local residents� ideas on how salmon should be allocated, should we have another year when there aren�t enough to go around. Although the week before the Iditarod Race start is already one of punishing hard work for everyone at KNOM, we occupied an entire three days producing continuous live coverage of this meeting, beaming the intense discussions across many hundreds of miles. The decisions which result will eventually affect almost every family in this vast region. To beam these live broadcasts from their originating sites to our studio, we use special high-frequency transmitters. One of them failed once again, during the elders� broadcast. Fortunately, we had a back-up. The failed unit, and the receiver we use back at the station, are both 24 years old, some of the most ancient and troublesome gear we have at the station. In total, they will cost approximately $2,600 to replace. Can you help? A handful of radio hobbyists have picked up the KNOM signal this winter from Norway, Sweden and Finland. How do they do it? Well, most of them spend their vacations in the far north regions of their countries at special listening posts, far away from electrical interference, and they use super-sensitive radios . Some of their receiving antennas are a half-mile long! Every month, KNOM broadcasts approximately 1,000 Inspirational spots. We air an equal number of educational ones, too. And, throughout more than 100,000 square miles of western Alaska, we beam the Rosary and other daily prayers, Sunday Mass, dozens of special programs addressing critical needs and important issues, and 24 hours of companionship and encouragement every single day. It�s all thanks to you. God bless you for your continuing support of this mission.